Once every few months, S/C contributor, Dan Armenti hits us up about shooting video for us. Every time he does, it provides us with some amazing work! This time around, we met up with Mike Galante on the well know South Street in Philly. We were welcomed with some warm weather and some light rain drops falling from the sky for this shoot. 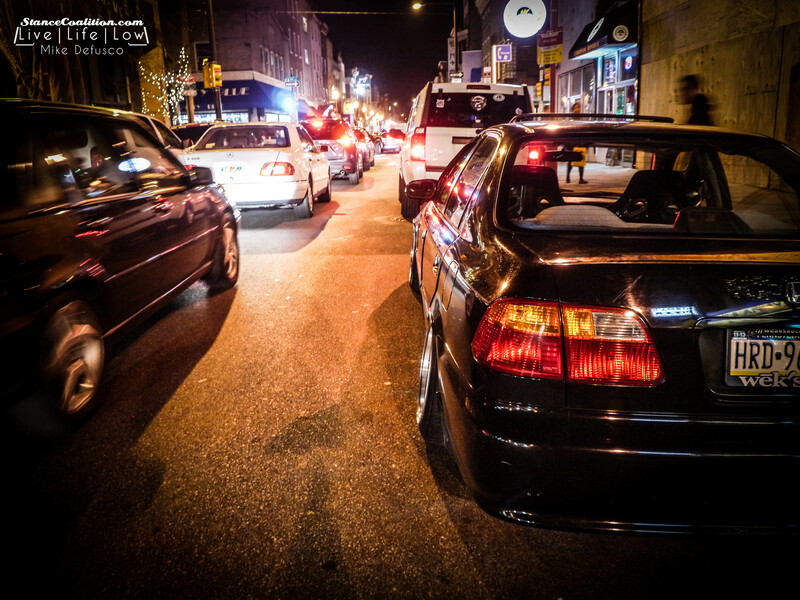 With the scenic backdrops and hustle and bustle of the city, South Street proved to be the perfect spot for Mike’s slammed Honda. Mike started to get into the lowered car scene when he picked up his first Civic only to wake up one morning and see it gone from the front of his house. He recovered with a red Miata that he also laid out on the ground, only to get hit and have the car totaled. Changing it up a little Mike then moved to a MK3 Golf that he fitted onto some salad shooters and it turned out to be best sold. I guess you can say Mike hasn’t had the most luck with his cars in the past. After getting rid of the MK3, Mike wanted to get back into the Honda game and began the search for a clean Civic. He drove 3.5 hours to go see this clean, stock, female driven, Civic sedan and it turned out to be the one! The Function and Form Type 2 coilovers keep the Civic planted to the ground and this Civic has seen many different wheel combos! Constantly changing it up keeps the appearance fresh for Mike and always catches people off guard while rolling to events. Many supporting mods for the car have also been done such as extended balljoints, new arms, extended tophats, etc to make this car handle and ride like a dream while still being slammed on the ground. The future for this Honda includes some fresh paint and even some motor work to make it move to match the looks! Wat type of tires on the ccws?